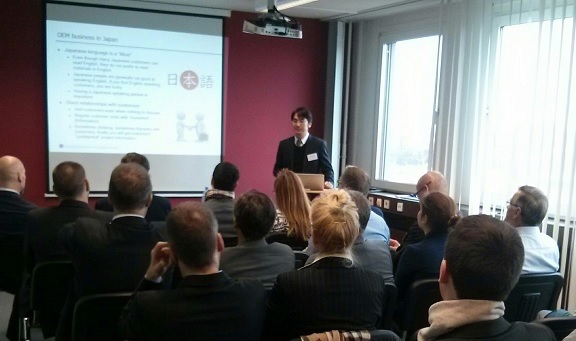 Fenetre Partners organized the roadshow “Distribution Channel Strategy in Japan” in Germany on November 20th & 21st, 2018. The events were hosted by M+V, our German local partner in Cologne & Stuttgart and accommodated over 60 participants in total. The topics focus on how to develop and manage distribution channel in Japan this time. Approx. 70% of participants answered that they have already entered Japan but are not satisfied with their sales and profit so far. Our speakers, Mr. Satoshi Takayama and Mr. Yasushi Hasegawa organized 5 case discussions in an interactive way and suggested 5 strategic options for how to develop or revitalize your distribution channel in Japan. Our representative director, Mr. Hasegawa was invited by IHK Rheinhessen as a guest speaker at its event “Wirtschaftstag Japan” in Mainz on November 22nd, 2018 as well. He spoke about “Intercultural influences in day-to-day business in Japan”. Over 30 people joined the event. Our roadshow seems very successful. Many participants gave us feedback that they got new knowledge and insights about Japan and love to have a dialogue with our speakers during and after the events. We plan to have the next events in Cologne and Munich, March 2019.